Grape vines and fruit orchards are deeply rooted in the history of the Rogue Valley. EdenVale Winery, EdenVale Orchards, and Voorhies Mansion in Medford carry forward this rich history in everything they do. Not only that, they’re dedicated to bringing the legacy of vine and tree to fruition. In addition to many award-winning wines, Winemaker Ashley Campanella has added Pear House Cider to the lineup—a 100 percent organic alcoholic pear cider. When I visited Campanella at the Medford estate for the EdenVale label, she was planning production of Pear House Cider and carefully selecting just the right glass for bottling and design for the label, which is screen-printed directly on the glass as opposed to standard paper labels. Amidst the vintages, aging in barrels was a ripe new idea to create a sparkling pear wine and put the signature pears to work in a new way. Her excitement for the project is contagious and she shares that Pear Houser Cider truly is a sparkling wine. It finishes a bit on the dry side and is a bright, crisp departure from many of the wine varietals offered. Campanella suspects it will appeal to beer drinkers and wine connoisseurs alike. Production time is shorter for the cider, whereas some of the red wine varietals at EdenVale age in the barrel for up to eight years. The Pear House Cider is a way to preserve the rich history and provide a new experience for patrons. The cider is available in splits (350 milliliters) as well as full 750 milliliter bottle, with an alcohol content of 6.9 percent. 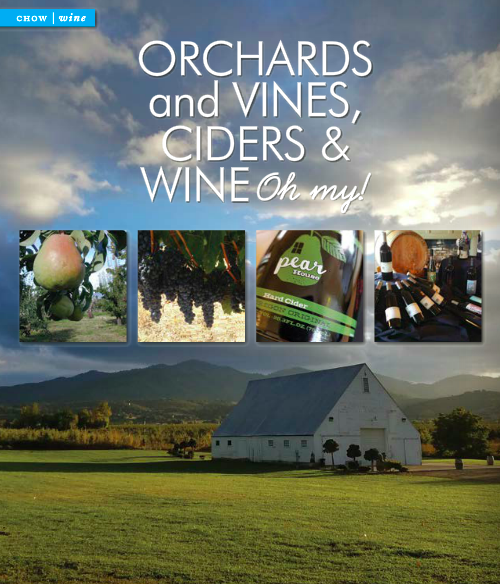 You’ll find the cider at EdenVale Winery, the Visitor Center in Medford, and at their sister location Enoteca Wine Bar in Ashland. Look for more sparkling wines, in particular a white and rosé blend, anticipated to release this summer. Currently, EdenVale offers a wide variety of wines to choose from. Campanella crafted her first EdenVale vintage in 2001, and today they feature two distinct labels representing choices for every palate. Classic Chardonnay and Pinot Noir are produced for the EdenVale label as well as a red blend and a white blend. Premium wines are produced for the EdenVale Pear House Collection Reserve label. Campanella selects the best fruit from local growers to craft Tempranillo, Malbec, Grenache, Cab Franc, Syrah, Merlot Port, White Port and Viognier. These wines can be found at select markets, fine restaurants throughout the Rogue Valley, online,and at the EdenVale and Enoteca tasting rooms. While tasting at either location is a pleasure, EdenVale will happily ship wine to you via their wine club options. Members of the EdenVale Wine Club receive specialty shipments of wine based on your preferences at a 15 percent discount, complimentary tastings of reserve wines at the tasting rooms, special member-only discounts on retail items, exclusive invitations to events and being able to reserve tours of the production facilities. There are currently seven Wine Club memberships to choose from, including shipments quarterly, semi-annually, three times per year, or every six months depending on what you prefer. Shipments can include white wine, red wine and mixed selections. Serious connoisseurs might prefer the Collectors Reserve Club. Beginning in 1885, the property has been cared for by multiple families, including the Ball Family, The Stewarts, The Voorshies families, The Earnest family and in 1999 The Root Family took ownership. Today, Ann Root is the co-owner and general manager of the winery. 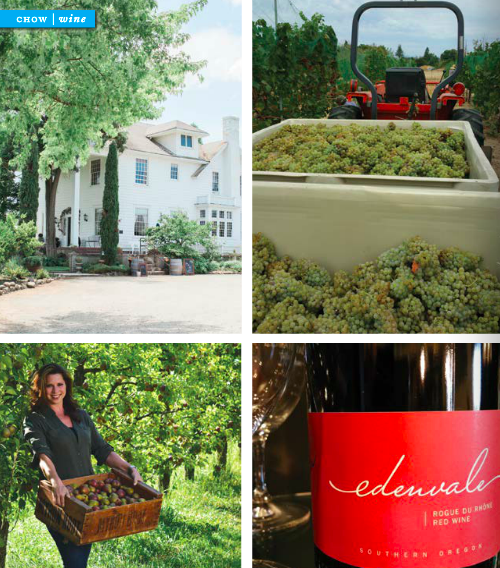 Widely recognized as the birthplace of Oregon’s commercial pear industry, EdenVale Winery is located on some of the oldest agricultural property in the Rogue Valley. The entire property is listed on the National Register of Historic Places. Revitalizing pear-producing land for vineyards and refocusing on premium wine production, the business is committed to sustainable agriculture, historic preservation, and agricultural education. Tours are available by appointment. At the heart of the property stands The Voorhies Mansion. This is an excellent representation of both architectural and agricultural history. The home, a 1920’s barn and estate (including formal gardens), is offered as an elegant venue for private events. The Roots partner with local causes and sponsor fundraising events for the Asante Foundation by hosting the Oregon Wine Experience, Oregon Wine University and Wine and Cheese to Please class. The Britt Festival is a favorite partner and you’ll find EdenVale wine on tap there. This year, a special, limited edition Britt red blend will be created exclusively for the venue and available on tap only. Winetasting is offered at two locations: The original estate at EdenVale Winery in Medford, where you can also enjoy live music featuring local musicians at the outdoor Summer Music Series, and Enoteca Wine Bar in downtown Ashland.